The Rs 16,000-crore Metro project is expected to be fully operational by 2024. 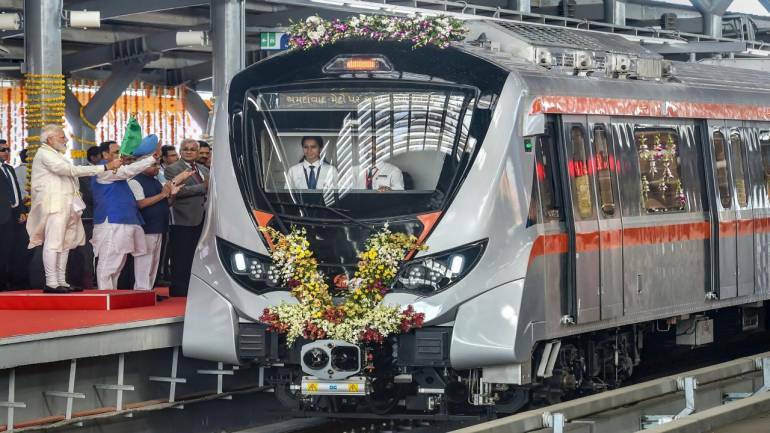 Ahmedabad (Metro Rail News): The 6.5-km stretch (Vastral-Apparel Park) of Phase-I (41 km) of the Ahmedabad Metro Rail project being flagged off by Prime Minister Narendra Modi on March 4, 2019. Union Cabinet approves the 28.2-km-long Phase-II of the project connecting the twin cities of Ahmedabad and Gandhinagar a few weeks earlier. It has taken four years for the Ahmedabad Metro network to be launched for public operatiob since the ground-breaking ceremony for the project was performed in March 2015. The 69-km network would not only boost connectivity in the Ahmedabad-Gandhinagar urban region but also ease traffic woes for over 60 lakh people, especially in the highly congested areas. The Rs 16,000-crore Metro project is expected to be fully operational by 2024. The Japan International Cooperation Agency (JICA) has extended a soft loan of Rs 6,066 crore for the project. This project is Funded by the Government of India and the Government of Gujarat on a 50:50 share basis and the project is being executed by the Gujarat Metro Rail Corporation Ltd (GMRC). “Work on the Rs 10,773-crore Phase-I is in full swing. It comprises two corridors. The North-South Corridor from Agriculture Produce Market Committee (APMC) to Motera will cover 18.87 km, while the 21.16-km East-West Corridor will connect Vastral station in the east to Thaltej in western Ahmedabad. We are looking to complete Phase-I by July, 2020.” Said Mr. Amit Gupta, Chief GM, GMRC. To purchase 96 Metro bogies (chair cars) , an order has been placed with Hyundai Rotem which would cost Rs 1,770 crore. The electrification work for Phase-I is being done by Siemens at an estimated cost of Rs 600 crore. Phase-II of the project would cost around Rs 5,500 crore, He added. It would connect Motera station in Ahmedabad to Mahatma Mandir, the venue for the Vibrant Gujarat Global Summit, the biennial event for trade and investment organised by the Gujarat government since 2003. The Gandhinagar Railway Station is the part of center station’s redevelopment programme which is a stone’s throw from Mahatma Mandir. The 2nd phase of the project would also connect Mahatma Mandir to the Gujarat International Finance Tec (GIFT) City. according to the blueprint, the entire network would have 54 stations, of which 32 would be in Phase-I and 22, in Phase-II. In 2003 it was conceptualized and faced several hurdles till now. Gujarat was the second state in the country to propose a Metro network after the successful execution of the Delhi Metro rail project. While the Gujarat Infrastructure Development Board (GIDB) had engaged the Delhi Metro Rail Corporation (DMRC) for a feasibility study in 2004, fund constraints saw the project being put on the back burner by the then Narendra Modi government in the state. In 2009, GIDB commissioned DMRC once again to prepare a detailed project report (DPR), with an SPV being formed to implement the project a year later. Construction work started in 2015 after the new Modi government at the Centre accorded the project necessary approvals. Previous articleAvishkar Hyperloop to represent India at Hyperloop Pod Competition on July 21, 2019.